The UOP-KAUST partnership deployed fully instrumented platforms in the eastern Red Sea, at approximately 22°N, 38°E, in about 700 m of water, for a period of two years. 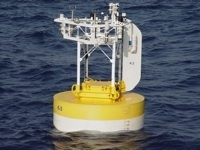 The first buoy at the site was in use between 11 October 2008 and 21 November 2009; the second was deployed on 22 November 2009, and recovered on 17 December, 2010. Nearby, a fully-instrumented shore-side tower, located on the new KAUST campus, at about 22°N, 39°E, continues to record and transmit data. Times in data files reflect the end of the hour during which averaged data was collected. 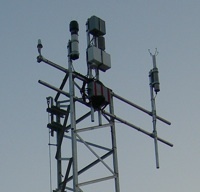 An ASIMet meteorological package is transmitting data in near real time from the tower using the Iridium satellite service. Buoy transmissions ended with the recovery of the final buoy system in December 2010. Real-time tower data files presented here contain unedited data for the latest 24 hours transmitted. A WAMDAS wave instrument package, supplied by the National Data Buoy Center (NDBC), was deployed on the KAUST surface buoys. Data is available in edited form on the NDBC web site (station 23020), and data presented on this UOP page should be used with caution. It is provided as a convenience. An inductive modem transmitted data from a series of sub-surface instruments deployed on the KAUST surface buoys. Data presented on this UOP page should be used with caution, as it is unedited, raw data as received via Iridium. It is provided here as a convenience. See links at right for data files.